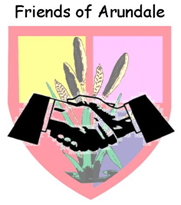 The Friends of Arundale is the name given to our PTA, anyone connected with Arundale; parent, grandparent, aunt, uncle, staff or simply 'friend' are able to be a part of the Friends of Arundale group. They are a committed group who are often on the look out for new volunteers. The 'Friends' carry out many fundraising activities throughout the year in order to improve the 'Arundale' experience for all our children. Below are just some of the few events that have taken place. Can we just take this opportunity to thank you all once again for your tremendous support, anyone who would like to help out in future please don't be shy, we are always on the look out for extra bodies. Please don't hesitate to come in and talk to Kelly Davies who will point you in the direction of a member of the Friends of Arundale team.